She is studying for a BSc Business Computing Systems degree and has completed the 3rd year on the Professional Pathway Scheme. Sadiqa Ali, now in her final year of a BSc Business Computing Systems degree at City, has been shortlisted as a finalist for the much-coveted 2017 Wise One to Watch Award. The annual award is organised by the Wise charity, which enables and energises people in business, industry and education to increase the participation, contribution and success of women in science, engineering and mathematics (STEM). 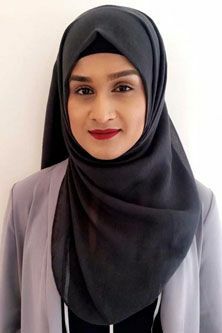 Through City's Professional Liaison Unit (PLU), Sadiqa has been a Professional Pathway Scheme student. Since 2015, she has been an IT Engineer at Firstco, a specialist in control and communication systems engineering. At Firstco, Sadiqa manages numerous in-house IT projects and has improved the company's IT infrastructure and systems. Having completed the ‘VMware vSphere: Install, Configure, Manage [V6]’ course, Sadiqa also runs Firstco’s Virtual Development Environment. Currently, she is working towards attaining her CCNA Routing and Switching certification to strengthen her understanding of networking technologies. She is a passionate advocate of girls studying STEM subjects and is working with her former sixth-form (Mulberry School for Girls) offering guidance to students considering STEM careers. As well as attending several career fairs as an advocate for both Firstco and STEM subjects, she also mentors two students from Mulberry and hosts talks and Q&A sessions to AS students about the endless opportunities in STEM. Sadiqa has been involved in various events celebrating International Women in Engineering Day over the last two years and assisted in bolstering the “9% of women in Engineering is not enough” campaign at an event organised by the IET, raising awareness about the lack of females in the industry. Sadiqa is keen on correcting demeaning gender stereotypes, preventing any female from being told: ‘You’re a girl, you can’t do that!’, and help them to discover their inner strength, enabling them to pursue what they really want! After graduating in 2018, Sadiqa plans to complete a Masters in Cyber Security, with the ambition of becoming an appointed expert in securing data and minimising threats. The 2017 Wise One to Watch Award takes place on 9th November 2017. In a network, a routing switch is a device that combines the functions of a switch, which forwards data by looking at a physical device address, and a router, which forwards packets by locating a next hop address, or the next closest router a packet can go through.